Hudhud: Intensifying cyclone about to strike India. 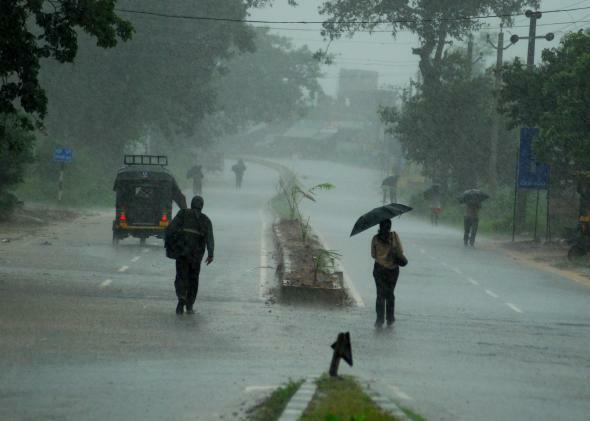 Heavy cyclone rain in Berhampur city in 2013. India is springing into action as calamity approaches its doorstep. Hudhud—a storm the size and potentially the strength of last year’s Phailin—is now just a day or so from landfall. The Indian National Disaster Response Force, crucial in last year’s effective preparations for Phailin, has been deployed to assist with coastal evacuations, which are now underway. Though international forecast agencies continue to sharply deviate from the official forecasts from India’s Meteorological Department, India’s authorities are setting confusion aside and proceeding with an all-out preventative assault aimed to achieve a “zero casualty” target. Track: It’s now nearly certain that Cyclone Hudhud will come ashore near the key port city of Visakhapatnam—known to locals as Vizag—the third largest city on India’s east coast, behind Chennai and Kolkata. The forecasted landfall location has barely budged since the storm first formed days ago. One high-resolution weather forecast model specifically tuned to tropical cyclones is forecasting a period of rapid intensification to begin Saturday morning, India time, possibly culminating in the equivalent of a Category 4 monster, with winds of up to 140 mph. Like the track forecasts, this impending growth spurt has remained remarkably consistent in forecasts since at least Wednesday. As of early Saturday morning, India time, it appeared this rapid growth spurt had begun. The National Hurricane Center lists the risks of a cyclone making landfall at Category 4 strength. For perspective, last year’s Cyclone Phailin—at one point a Category 5 behemoth, as strong as any storm ever measured in the Indian Ocean basin—also made landfall as a Category 4 with winds around 140 mph. Size: Hudhud is a large cyclone. A comparison of satellite images taken nearly exactly a year apart show Cyclone Hudhud is already the same size as Phailin. That means impacts from Hudhud will be felt hundreds of miles away from where the storm’s center makes landfall. On the left, Cyclone Hudhud, as seen Friday. On the right, 2013’s Cyclone Phailin. Surge: A government storm surge vulnerability map for the area shows isolated parts of the coast inundated with as much as four meters of seawater from a generic storm as powerful as Hudhud might be, though official forecasts mention a risk of only one or two meters. Storm surge is typically the most deadly aspect of tropical cyclones in the Indian Ocean basin. Rain and snow: After Hudhud makes landfall, it will be an intense rainmaker. The Hurricane Weather Research and Forecasting model—the same one anticipating a possible Category 4 landfall—is also forecasting around a meter of rain in isolated areas along the Indian coast. By the middle of next week, the remnant circulation of Hudhud will track across central India, helping boost groundwater supplies from this year’s meager monsoon rains. As it arrives in western Nepal, a few days of heavy rain (and snow in higher elevations) is likely. 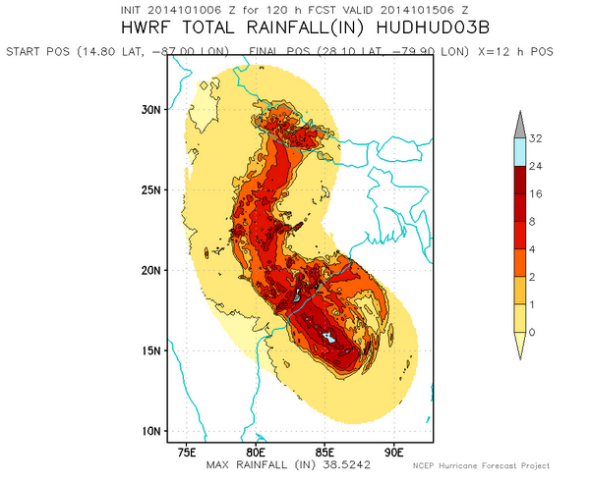 Heavy rain—and snow in the Himalayas!—will result after Hudhud makes landfall. Update, Oct. 11, 11:32 a.m.: On Saturday, Cyclone Hudhud rapidly intensified into the equivalent of a Category 3 storm. The storm is still expected to make landfall around midday Sunday, India time, near Vizag, as the equivalent of a Category 3.